The memory is clear. A wet day, overcast, still more winter than spring in Nashville. We pile in the car–Mom’s orange-red VW Beetle, possibly the white VW microbus, that part isn’t as clear or important–and drive to Donelson Plaza. Northwest up Murfreesboro Pike, right on Donelson Pike, follow that till it bottoms out, turn left, take the fork, drive up Old Lebanon Road. There was a Woolworth’s Drug Store and Dinette there. And Cain Sloan Department Store… or, if I’m being true to my child’s memory, it could’ve been Castner Knott’s. Four-year-olds don’t always notice things like that. It is there, in an empty lot by the Plaza, that we see the plane. It’s battered and twisted and there is a temporary fence around it. There is at least one TV crew there, with a huge camera. There is a crowd. What burns in my mind is the crumpled tin can body of the plane. I think, people died here. If memories are imprinted on a long reel of film, the frames around this moment are ghosted, too whited out by age and time to see. But I remember this broken plane and the destruction around it. Or I thought I did. At some point I started telling myself I made it up. I cobbled together news footage and childhood fears and maybe some vivid dreams and came up with this memory. Then today, I found it. I’d remembered a real event, after all. I discovered the plane had been carrying four men, and it had gone down, according to my father, on Todd’s Knob, a hill by Donelson Plaza. 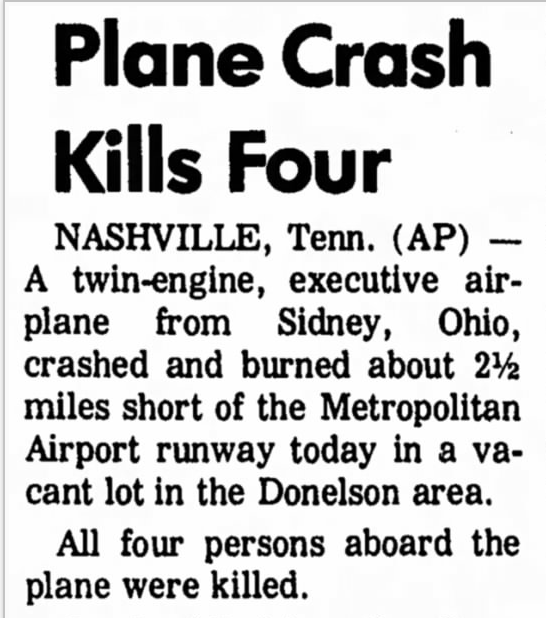 Dad’s memory for such events is striking in general and makes sense, especially here–he worked for the Nashville Airport Authority at the time. Dad thinks we saw the wreckage well after it happened but before it had been moved by the authorities and that rings true. There were many people there, just gawking–and I remember that, too, because even though I was only 4, I took in all the other people there and something about them scared me. We were staring at a nightmare, a tomb. Speaking on the phone with Dad, he segues into his own childhood story of a plane crash he witnessed near the end of World War II. He was 9. Jackie (my uncle, Dad’s older brother) and I were laying in the yard, watching fighter planes maneuver. Pretend dog fight. Dad’s family lived near a plant built late in the war to churn out new fighters that would be sent overseas. They collided, exploded. We ran to the field where they fell. There were small squares of aluminum hot and burning the grass. Bits of parachute fabric fluttering on blackberry bushes at the fence line. People–kids, locals, farm folks, sharecropper families–were crowding in. The military hadn’t closed off the area quickly enough. My grandfather, Dad tells me, made it home from work. But when they got in the car to go back out to the grocery, they were turned back. The road was closed. Dad is stuck on one detail. It is his own moment of nightmare. Of staring at a tomb. One girl found a finger. That girl who found a finger, she carried it around for weeks, showed it at school.